504. If the total GDP of Pakistan is Rs. 10,000 crore, then a GDP accounted for by Manufacturing is ? 505. 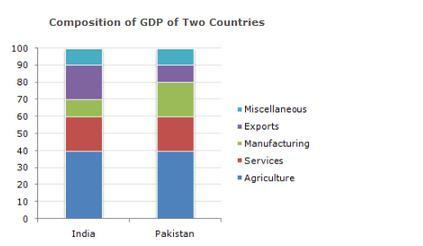 What fraction of India's GDP is accounted for by Services ? 506. If the total GDP of India is Rs.30,000 crores, then the GDP accounted for by Agriculture, Services and Miscellaneous is ? 507. Which country accounts for higher earning out of Services and Miscellaneous together ? 508. If the total GDP is the same for both the countries, then what percentage is Pakistan's income through agriculture over India's income through Services ?